Did you know that your eye doctor is often able to detect diseases simply by looking inside your eyes? Diseases such as diabetes, high blood pressure and even heart disease often show signs in the eyes first. An eye exam is so much more than simply evaluating vision for glasses or contacts. Your eyes are windows into your overall health. 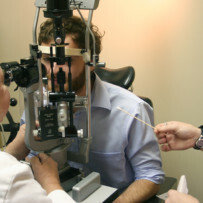 Your eye doctor will always address your vision needs and attempt to maximize your sight, but they will also perform tests to monitor your overall health to help you achieve the best health you can. Click here to schedule an appointment with one of our doctors!